Learning from Picture Books – PIRASAURS! Another fun book about pirates! And who doesn't love dinosaurs? I really enjoyed reading this one -- it begs to be read aloud. 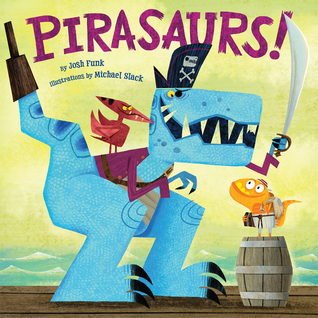 Meet the Pirasaurs, a ragtag team of seasoned pirate dinosaurs looking for adventure and treasure! There's fearsome Captain Rex, golden-toothed Velocimate, one-eyed Bronto Beard, and more fearsome, buccaneering beasts....as well as one new recruit who may be small, but who's eager to prove he can learn the ropes and find his place on the team. But when a trap is set upon the Pirasaurs while looking for buried treasure, it's up to the littlest recruit to show the team that there's more to a Pirasaur than meets the eye patch! Pirasaurs! written by Josh Funk and illustrated by Michael Slack, was published in 2016 by Orchard Books, an imprint of Scholastic. We rule the open seas! We'll cannon-blast you to the past! The rhymes in this story are clever and keep the rhythm going, so it’s a great example to study if you’re writing a rhyming picture book. I love the concept of pirate dinosaurs, which I bet is very appealing to young readers. There are some really fun characters in this story, like “Bronto Beard” and “Triceracook”. The big, cartoony illustration style really brings out their personalities. This is a fun read for the classroom. There’s lots of wordplay and language to engage students. I also like the message about cooperation instead of fighting! In my kindergarten classroom, I’d leave this book at a centre with some toy dinosaurs and perhaps some blocks for building a pirate ship. Draw your own pirate dinosaur character. What would you name it? Make a treasure map on thick paper. Cut it into pieces and see if a partner can put it back together. What words rhyme in this story? See if you can hear them as your teacher reads aloud. Talk about some ways to cooperate in your classroom “pirate ship”. I don't often find books with mysteries in them for young children, so I was intrigued by this one. It was especially fun that the children were hunting a dinosaur! Sally and Joe are convinced that the mysterious footprints they have discovered must belong to a dinosaur! Could it be? Join them as they follow the clues to find out…but wait -- what if Sally and Joe are right? What if it really is a dinosaur? 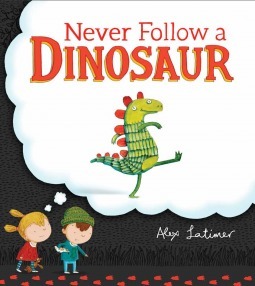 Never Follow a Dinosaur was written and illustrated by Alex Latimer. It was published in 2016 by Peachtree Publishers. This cumulative story was a bit different than others that I’ve read since each time a new description of the dinosaur was added. I loved the idea of building on clues through the story. The illustrations were fun! I really liked the way their imagined dinosaur changed as they found more clues and made more guesses. The clear illustrations make this a nice book for reading aloud to a group. I really liked the clues and how the book modeled that knowing more changed their ideas about what the dinosaur might be like. I also really liked the plans they drew for their trap. It’s a good book for making inferences. Make a list of the clues Joe and Sally found when hunting for the dinosaur. Is there another explanation? Draw your own plan for a dinosaur trap. Label the key features that will help catch a dinosaur. I loved Jo Knowles’ emotional middle grade SEE YOU AT HARRY’S, so I was excited to read this book. It’s written from the perspective of a boy whose sibling has a mental illness. Noah is just trying to make it through seventh grade. The girls are confusing, the homework is boring, and even his friends are starting to bug him. Not to mention that his older sister, Emma, has been acting pretty strange, even though Noah thought she'd been doing better ever since the Thing They Don't Talk About. The only place he really feels at peace is in art class, with a block of clay in his hands. As it becomes clear through Emma's ever-stricter food rules and regulations that she's not really doing better at all, the normal seventh-grade year Noah was hoping for begins to seem pretty unattainable. 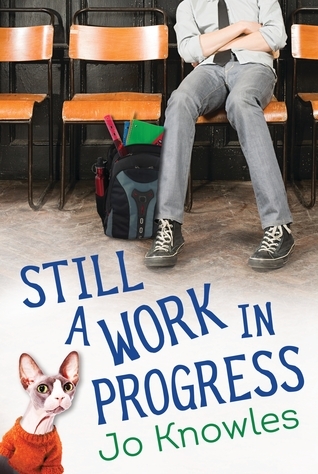 In an affecting and realistic novel with bright spots of humor, Jo Knowles captures the complexities of navigating middle school while feeling helpless in the face of a family crisis. Still a Work in Progress was written by Jo Knowles and published by Candlewick Press in 2016. When I first started reading, I wasn’t sure I’d like this story, even though the realistic details made me feel almost like I was entering middle school myself. As I read on and let myself get to know Noah, I couldn’t put it down. I wanted to find out what was going on with his family and sister Emma. Experiencing the situation through Noah’s thoughts and perspective made me think about how the whole family is affected when one person has a mental illness. Jo Knowles includes specific details and images to create an authentic story. I’d read this one again to study how to write a story about the sibling of a person in a difficult situation. I really liked this perspective and I think it’s an area of middle grade that has been overlooked. Another great example of a character-driven contemporary middle grade. “I am not afraid of Molly Lo,” Ryan tells me from inside the stall in the boys’ bathroom. Jo Knowles is the author of See You at Harry’s, another middle grade book I really recommend (see my thoughts here). She has also written several YA novels. There is a teacher guide for this novel.